Sure, it's odd, but in typical Japanese style the engineering behind the Copen is impressive, and it's rather amusing to drive. A tiny, folding hardtop roadster that looks like a refugee from Noddy's Toytown might be a niche too far for many, but the Daihatsu Copen shouldn't be written off entirely. Sure, it's odd, but in typical Japanese style the engineering behind it is impressive, and it's rather amusing to drive, too. Why so small? The Copen is designed to Japanese 'kei car' requirements, their tiny footprints working in Japan's congested cities, giving their owners some tax breaks, too. The usual result of such stringent dimensional restrictions is a space-efficient box, but the Copen is all about having fun, Daihatsu creating a tiny sports car with a folding aluminium hard-top. The rest of the specification is equally interesting, the European offering's engine being a 1.3-litre 16-valve petrol four-cylinder unit, while Japanese models come with a four-cylinder 699cc turbocharged engine. EU cars came with a five-speed manual gearbox only, while Japanese cars were also offered with a four-speed automatic. 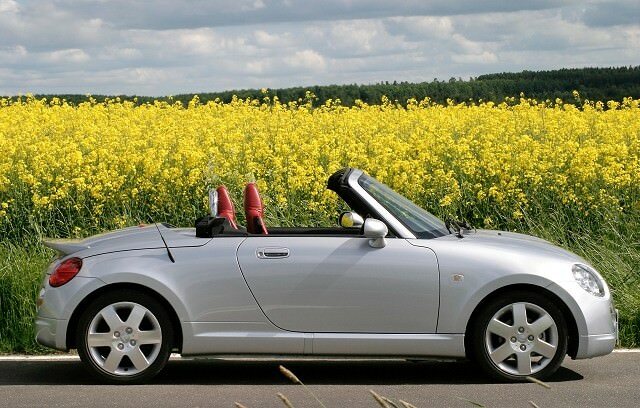 Unsurprisingly, its tiny size and huge compromises that result mean tiny sales, so the Copen is a real curiosity in Ireland. Indeed, if you can find one to buy you'll be unlikely ever to come across another. Production ceased for European models in 2011 and while a second generation car exists, there are no plans to ever bring it to Ireland. There's only one, and there's only a handful of them around. You'll need to be a committed buyer to find one.